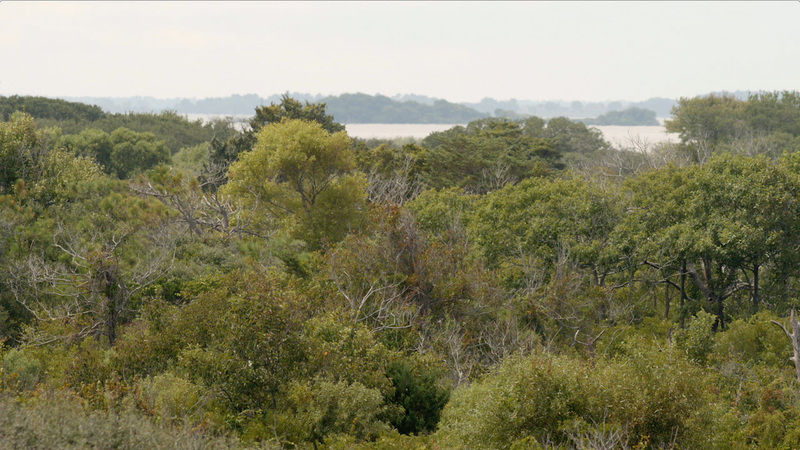 A maritime forest is a forest that is on the coast and is influenced by sea-spray. You start with vegetation like shrubbery that is a little salt-tolerant. As you get further from the ocean, you'll start getting larger and larger trees that protect the trees behind them. These areas are not found very many places up and down the coast, so they're kind of an oasis for wildlife. You'll find freshwater swamp, maple swamp forest in the middle of the reserve. You're never more than half a mile from the ocean, but the changes in habitat are pretty impressive. Many years ago, the entire barrier island would have been covered with forests just like these. Over time, you know, the areas have been developed for houses and commercial development. Barrier islands migrate, and when the island itself moves, the trees can't move, so as the island moves, the trees are left eventually in a changing habitat and you can see that with the stumps that are present on the beach. Maritime forests are important for coastal resilience. They stabilize the shoreline, they provide filtering effects, shelter for the marsh behind the maritime forest, and just stabilize the whole region. I think it's important to have areas like this preserved for people to be able to see what the islands were like before they were developed, provide that outdoor laboratory, that educational space, to take school-kids and to do research. Maritime forests are shoreline estuaries along coastal barrier islands that are relatively pristine and support a great diversity of plants and animals. Maritime forests, like all estuaries, are essential for storm protection. They also conserve important nutrients and groundwater.